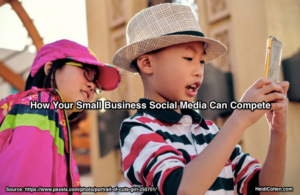 Want your small business social media to stand out and yield measurable results? You still can although it may take longer to achieve your objectives. The reality is social media still works for small businesses if you consistently publish, curate and engage with your followers on topics core to your offering. Let’s look at the research results to see how you can apply them to your small business without breaking the bank. Social media usage by platform has remained relatively stable based on 2017 Social Media Examiner Research. Instagram usage continues to grow largely attributable to its focus on photos and video. 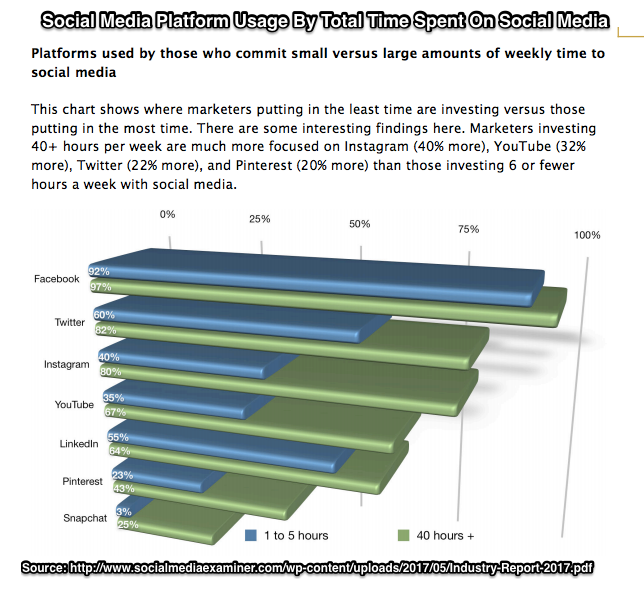 As marketers gain social media experience, they expand the number of platforms they use and the amount of time they spend per network. Note: Social Media Examiner doesn’t consider blogs as a social media platform in its research. I disagree with this classification. 62% of respondents consider Facebook to be their most important social media platform. This isn’t a surprise. Facebook reached top media status with ad agencies at the end of 2016. Based on its reach and user numbers, businesses of any size need to be on Facebook. 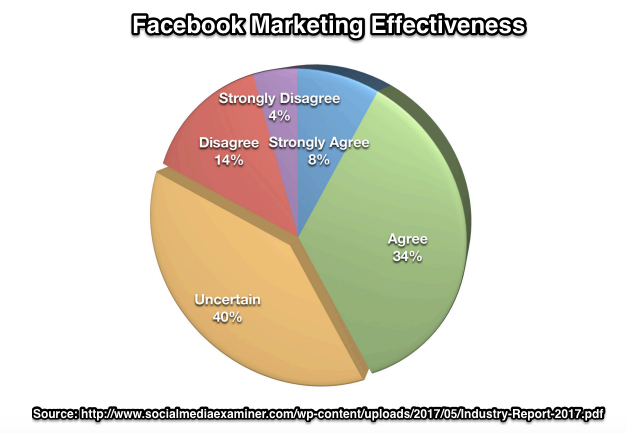 42% of respondents believe their Facebook marketing is effective. 40% of respondents don’t know if their Facebook marketing is effective. While officially Facebook has stated they’ve decreased newsfeed visibility, roughly 2 out of 5 respondents were unsure of their newsfeed exposure. 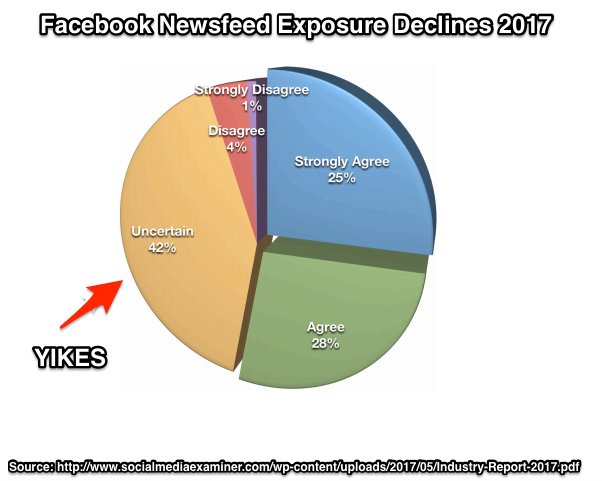 53% of respondents saw Facebook newsfeed visibility decline. 42% of respondents were unsure of their Facebook newsfeed visibility. Despite Facebook newsfeed decline, marketers are posting the same or more on the platform. This is consistent with other research, namely Buffer. Follow Mari Smith, Jon Loomer, Amy Porterfield and Andrea Vahl. As a point of comparison, here’s Inbound Marketing Research results stacked up. To understand what it takes to get your small business recognized on social media, understand these 5 challenges. What’s the best way to engage with my audience? How do I measure return on social media marketing? What’s the best way to use paid social? How do I find my audience on social? These small business folks want to act. They’re not thinking about their long-term strategy or integrating social media into a larger plan. The reality is most small businesses don’t have the time or resources to create a marketing strategy integrating content, social media and other forms. Who are you doing this for? Define your core audience so you can find them on digital media, offline media and in real life. Create a marketing persona. What do you want to be known for (Hat tip: Mark Schaefer)? Limit yourself to 3 key topics. Don’t be everything to everyone. What is your defendable niche? After you’ve answered these questions, determine how you’ll measure success. Joe Pulizzi focuses on email addresses. For small businesses, time is their scarcest resource. Therefore time spent on social media is a proxy for budget. If you’re a solopreneur, you’re trading your time versus outsourcing your social media creation and interaction. 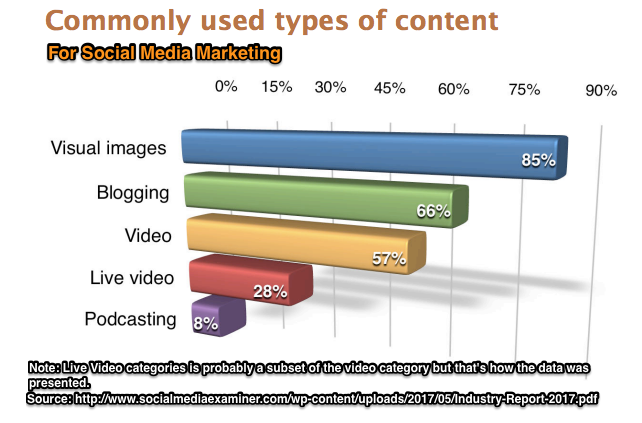 Visual content dominates social media. It’s eye candy that attracts attention, especially graphics and images. Need Instagram help? Check out Sue Zimmerman and Jenn Edwards. Video continues to be hot, especially live video. Think live events and news. But it’s key to adapt your video to the platform you’re using. Remember YouTube is the second biggest search engine after Google. Need video help? Amy Schautter is your girl. Blogging keeps on going. While it’s no longer the social media darling, it’s owned media where you can post email registrations and contact information. Podcasting remains an opportunity even though it’s no longer a new approach. If you decide to add podcasting to your content offering, post your podcasts on your blog for extra distribution. 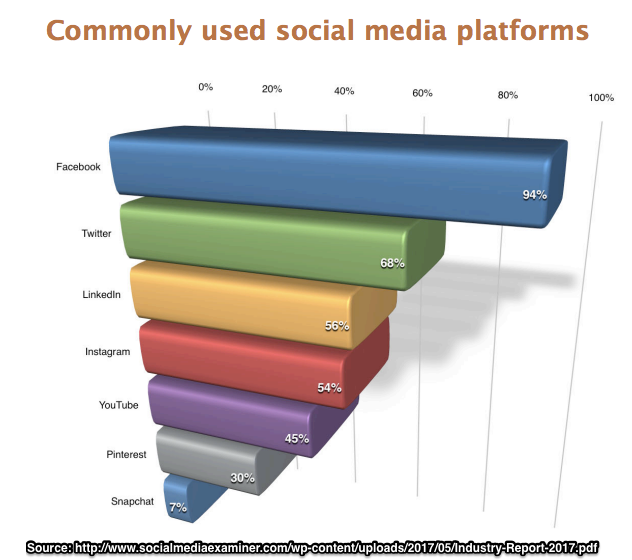 Here’s how respondents engage on each platform. Facebook averages 8 posts per day; 39% of respondents increased Facebook posting in 2017. Despite reduced newsfeed visibility, this trend is consistent with other small business research. Twitter averages 6 posts per day; 55% of respondents increased Twitter posting in 2017. Instagram averages 4 posts per day; 41% of respondents increased Instagram posting in 2017. LinkedIn averages 4 posts per day; 31% of respondents increased LinkedIn posting in 2017. Pinterest averages 3 posts per day; 16% of respondents increased Pinterest posting in 2017. Snapchat averages 1 post per day; 8% of respondents increasing Snapchat posting in 2017. Note: YouTube postings weren’t stated. Use a social media scheduling tool to batch post social media content. Create social media content when you’re doing other content creation to tailor information by platform and minimize costs. Curate quality content relevant to your topics. While paid advertising offerings on social media platforms continue to evolve, for small businesses, Facebook advertising is a must. 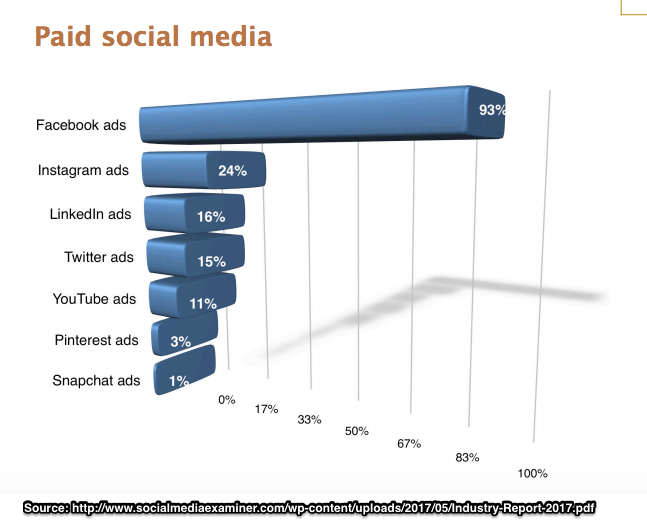 93% of respondents use Facebook advertising. With limited time and budget small businesses must focus on creating quality content and communications using tools to streamline social media processes and scheduling. They don’t have the resources to test many advertising options. Be smart about how you engage on social media. Determine what 3 categories or words you want to be known for. Remember consistency is key. These 3 words should be associated with your brand and your business. Get bonus points for applying these words to your search strategy. Check hashtags used by thought leaders and your competitors. BUT remember they may approach your market differently. Use FollowerWonk to find key people on Twitter. Use BuzzSumo to determine key topics. Define your audience. Who do you want to attract and why? What sets them apart? Create a marketing persona to know what information they seek and what platforms they use to find it. Social media is about being social. Don’t go it alone. Take a page from Ann Handley and find your squad. Include your prospects, customers, influencers, and others. On average most people have about 150 connections on social media. This is the Dunbar number. Small businesses gain from having a squad to get your message out across social media platforms. Tap into a small group of friends to promote each other’s content. To minimizing brainstorming, use an editorial calendar to create and find useful content. Block out marketing campaigns and major holidays that matter for your business. But don’t use social media to push out sell messages. Promote related content around these themes. Create content on one topic per week. If you’ve got limited resources, maximize the reach of every piece of content by developing related social media shares and pre-populating your feeds. Just as you schedule time to respond to and send email, do the same for social media. Where appropriate participate in relevant TwitterChats and Facebook Groups to stay visible and build your follower base. Leverage your social media activity to get people to register for your email list. The biggest take-away from 2017 Social Media Examiner research is small businesses are using social media to achieve business goals. You still have an opportunity to achieve your business goals with social media. But (you knew there was a hitch) social media is getting noisier. As a result, you must look for an opportunity where no one else is or consistently be better than the competition. You can do this without spending hours per day on social media. Use what the majority of respondents do to stay abreast of social media activities that have an impact on their business. The small business social media key: Your social media use must be good enough to support your business and achieve your goals. Find the tools that work for you and use them to get the most out of your social media use. Tags 2017, Facebook, Research, Social Media Examiner. Bookmark the permalink.